Rabbit is frightened and dismayed. How will she ever be able to get the bad animal out of her house? 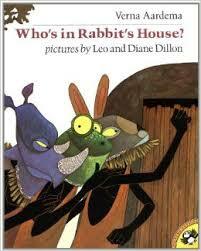 The story, adapted from a Masai tale, tells how Rabbit’s friends try to help her solve her problem. There is almost limitless potential for creating activities that relate to this book. It can serve as a jumping off point or enhancement for a unit on Africa, on folk tales, on other cultures, or on the various animals in the story. The revelation of the “scary animal’s” identity could launch an activity about sound amplification. A discussion about the different ways each animal tried to solve the problem could lead to activities about empathy and problem-solving. Children will love re-telling this story using a flannel/felt/magnetic board activity set. Come back later this week for instructions on to make your own set from the original illustrations or from our free downloadable patterns. If the children are old enough to read, you can give them scripts to read. If not, help them learn their parts by rote. If you have more children than you have parts, you can cast children as parts of the scenery or give them African instruments to play. Optional backdrop – Attach a blanket or shower curtain with an African theme to the wall behind the “stage,” or have the children draw a scene on butcher paper and attach it. Rabbit’s House – A refrigerator box makes a great hut, and children will enjoy decorating it. But you don’t have to be nearly so fancy. A blanket draped over two chairs makes a perfectly serviceable house. A log to sit on – If you’re industrious, you can make one from chicken wire and papier mache, then paint it. But a log-shaped bolster or rolled up pillow will do just fine. A tree – You could make one from butcher paper and put it on the wall, or use a broom or mop. Or a child could play the role of the tree, by standing still with arms held out and bent like branches. A lake – A piece of blue cloth works well for the lake, either held vertically between two sticks or laid flat on the ground. A big leaf to be used as a bullhorn – a piece of green construction paper with rounded edges. You can draw on the veins with a marker. Can you think of other activities to do after reading Who’s in Rabbit’s House? Please share them in the comments. I’m not really familiarized with the different types of children books, but I am interested in learning more about this book, given how much potential there is in the book(as you stated). Thank you, Rebecca! This is a wonderful book, with a lot of repetition (the good kind), so kids are encouraged to chime in. I think plays are wonderful for community work, but you have to be careful with them because of copyright issues. If it’s a small group, done in a class setting, I think it would be great. If there are going to be spectators, a story that’s in the public domain would be a better choice. There are lots of those you could easily adapt, like Aesop’s fables, folk tales (which you adapt in your own words, based on the original), stories you adapt from Greek or Roman mythology, and so on. This is a great site and will remain bookmarked on my computer. I will use it as a reference as much as possible. I home school m 5 year old and there is always room for ideas and creative things to keep him focused and active. Thanks again for this site and i look forward to reading more as you write. Hi, Mark. What an amazing adventure you have ahead of you! 5-year-olds are little sponges–so curious and creative. Please let me know if there is anything specific you want me to cover. I’m also going to be adding some patterns for masks and instructions for felt/magnetic board sets soon. My husband has always read to our kids when they were little and now they are book worms 🙂 I will have to check this one out. I really like folk tales, they always seem to have a good moral. I will look for this book at my local library. If I can’t find it there, where would you recommend I get it from? Hi, Andrea. If your library doesn’t have it, you can order a copy from Amazon, Barnes & Noble, or other online bookstores. If you have an independent bookstore (here in Nashville, we have a wonderful indie bookstore called Parnassus Books), they should either carry it or be able to order it for you. Clicking on the book cover will take you to the book’s Amazon page. Congratulations on raising little bookworms!